Admission fees: Adults 5 Euros, students 3 Euros . Jewish Museum of Greece - 39 Nikis st., tel. : +30 210 3225582. Sephardic Synagogue Beth Shalom - 5 Melidoni st., Thission. Romaniote Synagogue Etz Hayim - 8 Melidoni st., Thission (only functions during the great holidays). Central Board of Jewish Communities (K.I.S.) - 36 Voulis st., tel. : +30 210 3244215-18. Jewish Community of Athens - 8 Melidoni st., tel. : +30 210 3252823. Ancient Synagogue - in the Agora (ancient marketplace) near the centre of Athens. First Cemetery of Athens - in the area of Neos Kosmos, near downtown Athens. Cemetery and Monument for the Victims of the Holocaust - 3rd Cemetery of Athens, Nikea, Piraeus. Monument to Young Jews (dedicated to the memory of young Jews who died in the Holocaust) - Pafos square, area of Kato Patissia, north of downtown Athens. Jewish Elementary School - area of Paleo Psyhico, NE of downtown Athens. The Jewish Museum of Greece is at 39, Nikis street, in the centre of Athens, not far from the Acropolis and other sites of interest. Its 19th century renovated building is easy to find, as Nikis st. runs parallel to the very busy Filellinon st. and Amalias Avenue, while being quite close to the Syntagma Metro Station. By far the easiest way to get there. Get off at Syntagma Station. 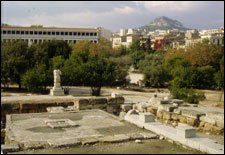 Once in Syntagma Square, look for Mitropoleos st. (in the lower half of the square, at its SW corner). The first street branching off the left of Mitropoleos street is Nikis. Number 39 is a three minute walk from there. You may use several buses or trolley buses depending on where your starting point is. Ask for those which stop at Syntagma (and then proceed as above) or at Filellinon st. There is one bus stop and one trolley-bus stop in that street, next to each other, across what is called the “Russian Church” (no, it doesn’t look Russian at all). Once off the bus, turn right into a small, pedestrian alley (Kydathinaion) and then right again; the Museum will be on your right-hand side. The museum is conveniently close to the T1 Tram Line, namely Zappeio-N. Faliro. Get off at Syntagma, turn your back to the National Gardens and cross the busy Amalias Avenue, then, its parallel Filellinon st., and walk on to the next parallel street, which is Nikis. The museum should now be on your left. Once in Plaka or Monastiraki, you cannot miss Adrianou street, easily recognised by the dozens of souvenir shops and throngs of tourists. Look for Kydathinaion street, which branches off it. 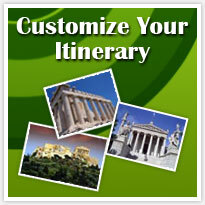 With your back to Akropolis, go down Kydathinaion street, until it intersects with Nikis street, about 4 minutes away. The Museum should be across the street, on your left. The idea of building a Jewish Museum of Greece was first conceived in the 1970’s by members of the Jewish Community of Athens, who offered every kind of assistance towards the realisation of this dream. 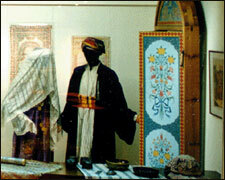 The Museum was first established in 1977 and housed in a small room next to the city’s synagogue. It housed objects salvaged from WW II, whether artefacts, documents and manuscripts of the 19th and 20th centuries, or the jewellery of the Jews of Thrace that had been seized by the Bulgarians in 1943. The latter had been returned to the Greek government after the abdication of the Bulgarian king and the establishment of a communist regime in the country. The following years saw a thorough and careful collection of material from all the communities of Greece, under the inspired guidance of Nikos Stavroulakis, director of the Museum until 1993. The collection expanded with rare books and publications, textiles, jewellery, domestic and religious artifacts, thanks to the interest of several individuals. The Museum soon began to attract the attention of many visitors, researchers and donors. 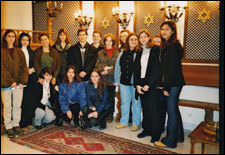 In 1981, the Association of American Friends was founded, followed, a little later, by the Association of Friends of the Jewish Museum of Greece, with members of the Jewish Communities of Athens and Thessaloniki. As the Museum’s collection grew and its activities expanded, it soon outgrew its first premises and new ones had to be found. In 1984, it moved to a rented space occupying the 3rd floor of 36, Amalias Avenue. The exhibition was reorganised into thematic units covering the interests of its various visitors. After years of efforts, the Museum acquired its legal status in 1989, as a non-profit foundation with a seven-member Board of Directors. In the following years the Museum’s activities expanded; they involved both the research and study of the Greek Jews - in collaboration with other foundations and researchers from Greece and abroad - and publishing. At the same time, its collection was being continuously enriched with new acquisitions from all over Greece, greatly exceeding all expectations. 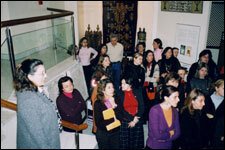 The increasing needs of the Museum for more space, together with the dream of sometime having its own premises, led to the purchase of a 19th century neoclassical building, with the support of its Friends in Greece and abroad, the Jewish Community of Thessaloniki and the Central Board of Jewish Communities in Greece. 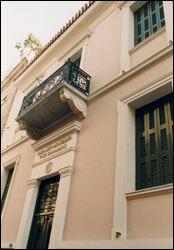 With substantial financial support from the Greek Ministry of Culture and the Associations of its Friends, the old building was renovated and, in late 1997, twenty years after it first opened its doors to the public, the Museum moved to 39 Nikis street, its new address in the centre of Athens. 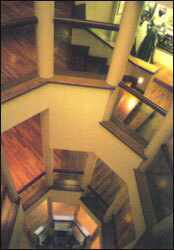 On March 10th, 1998, the new building of the JMG was inaugurated and a new area begun for the Museum. In the following years it developed significantly and extended all its activities, and especially the educational ones. Also, it improved its visitors services and conducted thorough research efforts, the results of which were communicated through several temporary exhibitions and special publications. Contact and communication with the public and international relations and activities of the JMG, signal an extensive social and scientific information and influence exchange. The Museum’s collections include more than eight thousand original artifacts, testifying to more than 23 centuries of Jewish presence in Greece. 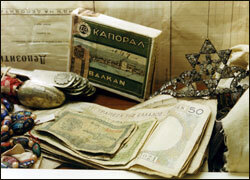 Besides a few objects which Asher Moissis, president of the Jewish Community of Athens, had collected after the war, the core of the initial collection was made up of items that had been returned to Greece by the Bulgarian government, after the establishment of a communist regime in that country. These included personal effects, jewellery, domestic items, synagogual objects and documents, which belonged to the Jews of Eastern Macedonia and Thrace and were confiscated after 1941, when the area fell in the Bulgarian zone of occupation. The confiscated items had been meticulously recorded and became the first significant body of artifacts of the collection. This core material kept multiplying, mainly through the donations of individuals and communities, initially from the area of Thessaly, the island of Rhodes and the city of Ioannina. Besides rare 17th - 19th century books and publications, a significant number of ritual textiles was assembled, during the years 1977-1982. Most of them date from the Ottoman times (14th-19th centuries), and soon became one of the Museum’s main attractions, for both visitors and researchers. In 1984 the Jewish Community of Patras was dissolved for lack of members and the interior of its synagogue, along with its textiles and ritual objects was bequeathed to the Museum. These religious artifacts are extremely significant, invaluable and irreplaceable, since they come, for the most part, from synagogues and communities, which no longer exist. After these early acquisitions, began the organisation of the artifacts into categories: ritual objects, domestic and personal items, and Holocaust artifacts, documents, and information material. More donations from individuals and communities from both Greece and abroad continued to pour in, further enriching the collection. The Museum’s relocation to its new premises (1998) brought a renewal of public interest and more donations followed. In general, the Museum has been receiving an average of 250-300 new artifacts every year, since the year 2000. Its unique collections, which are continuously being expanded, document more than four centuries of Jewish life in Greece, considering that the oldest textiles and antenuptial contracts date from the 16th century C.E. Notes: These are the tours that we suggest, but you can customize your itinerary the way you and your Family feels more enjoyable and comfortable. In most of the tours in Greece, sport type shoes are recommended.